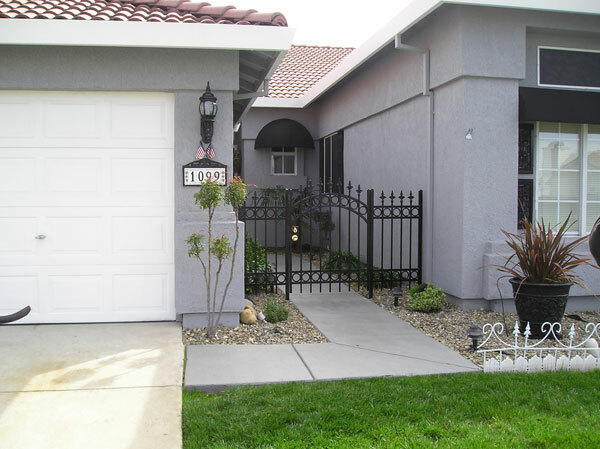 Many people come to us wondering what the difference is between courtyard gates and driveway gates, and which they should choose for their Sacramento, CA home. Courtyard gates and driveway gates are very similar; in fact, they perform the exact same function: to gate off your driveway so that only people who are welcome in the home can drive up to the house. The only difference is that courtyard gates have walls surrounding the enclosed area that you drive into, and driveway gates are gates in a fence, usually one that you can see through. With a driveway gate, you drive through a yard to the house, and with a courtyard gate, generally the house, or at least outbuildings connected by walls, surrounds the courtyard that you drive into. Both courtyard gates and driveway gates can be impressive works of art, and they are important statements about you and the pride that you take in your home. With wrought iron gates from Linmoore Fencing, you can choose any look and style for this important part of your exterior decoration, from simple, clean lines to ornate curls and designs. Your courtyard gate or driveway gate is perhaps the central element in your home’s design, looking in from the outside, because this is a part that your guests will see close up when they drive up to your home, so you want to make sure it looks as beautiful as possible. Our design experts and craftsmen at Linmoore Fencing will help you decide what kind of gate is best for you and what design will best suit your exterior architecture and landscaping, as well as reflecting your taste and style. We will also help you decide what kind of entry system you want, whether you want a remote entry gate that you push a button from your car to open, or if you want a keypad access, or if you want a combination of the two.